The National Assembly building in Luanda, Angola. David Stanley/Flickr. Some rights reserved. 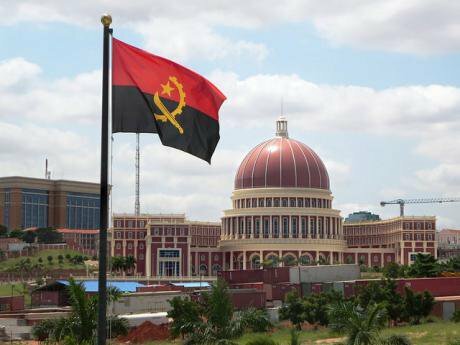 99% of Angolans, those who are neither related nor have befriended the ruling party Movement for the Liberation of Angola (MPLA) elites, are facing yet another backlash. And there have been more than a few in the last 36 years. Now the threat hovers around Angola´s digital realm. Social media have become the latest target of president Dos Santos in his attempt to quell civil society and bottle up discontent. His intentions, known through an informal announcement during the traditional presidential New Year´s speech, are not good news for what is left of Angolan civil liberties. Dos Santos call for action against the free use of social media does not come as a surprise. During his New Year speech, the president, who has now been formally in office for 36 years, gave a sermon on social media politeness, and talked about the democratic values of the country. Viewers were told that social media should comply with certain rules in treating ruling politicians, and that the government should take appropriate action to guide both society and the institutions, and avoid unacceptable practices. Angolans who will not speak the language properly will be facing repression and censorship. Angola´s internet users are only 26% of the population. More than a half of these have a Facebook account. Even though this figure is way behind that of the internet users’ average in developed countries, Angola´s elite is becoming increasingly anxious with what is being shared online. Also, more importantly, with what international actors are learning about Angola´s state of affairs. Sarcastically, Dos Santos speech did not stop here. He found time to defend passionately the Angolan citizens’ right to freedom of expression and access to education. It is quite understandable, though, that in a country where political rights and civil liberties are actually restricted, digital activism has become the citizens last resource to exercise their freedom of expression. The government has yet to block access to online content, but Dos Santos is eager to deal - legally or extra-legally - an ultimate blow to Angola´s dissenting voices. This is not the first time Dos Santos attempts to repress social media. Back in 2011, he tried to pass a law on the matter. However, international developments such as the Arab Spring and the Occupy protests advised him to put it on hold. The regime, then, chose to use more subtle methods. Online patrols were commissioned with monitoring internet debates and keeping track of all possible dissidents. Repression, subtle as it may have been, was the name of the game. The internet, and in particular social media, went on to become Angola´s freedom of expression last frontier. Internet censorship, however, did not make its way back to the scene spontaneously. Several activist organizations such as Maka Angola or Central Angola 7311, which have been struggling to show what the regime is really like, logically put the government on guard. Maka Angola´s director, Rafael Marques de Morais, has been in the forefront of the struggle from day one. A committed and impartial journalist, Morais was found guilty of several counts of slander, and his website has repeatedly suffered technical attacks. Central Angola 7311 has also been defying Angolan authorities. Their name refers to the date of their first organized protest, on March 7, 2011. They have been actively exposing the regime’s lack of compliance with civil rights. Back in 2014, they organized several flash mobs to protest against restrictions on freedom of expression and assembly. These protests where violently repressed, but the digital activists managed to document the protests, as well as the violent police response, and shared the materials online. Angola´s activists have paid a heavy price for dissenting in the analogical world. Traditional media and journalists have been physically harassed and targeted for sharing information on the country´s state of affairs. Pursuing their struggle in the digital world has up to now spared many of them, such as the Central Angola 7311 activists, from revisiting Angolan prisons, where many of them were abused and tortured simply because of their participation in peaceful protests. It was not, however, until the arrest of fifteen Angolan activists and their leader, Luaty Beirão, who went on hunger strike to protest against their wrongful detention, that the scenery of impunity changed. Suddenly, Angolan officials faced international criticism and scrutiny. Social media were extensively used to further the activists cause, and Dos Santos reacted. He could not tolerate such a destabilizing leak for his authoritarian regime - a regime, it should be remembered, that has been unable to get out of the “not free” category in the yearly Freedom House report. Being able to broadcast locally and internationally the harsh realities behind Angola´s official façade, Maka Angola and Central Angola 7311 became the new “enemies of the State”. Dos Santos is determined to put an end to this kind of activity by curtailing digital freedoms. In an information and communications ecosystem where the Angolan government already controls all major newspapers, radio and TV outlets, social media are the last frontier to fight repression and defend freedom of expression. The war on social media has begun. Following Dos Santos announcement of a crusade against social media “rudeness”, for the first time in the country´s history a judge is hearing a case regarding a political joke about an imaginary government. Father Jacinto Pio Wakussanga, an innocent man, was jokingly chosen in a Facebook discussion to become one of the members of a hypothetical government of national salvation. As the Father later explained to the judge, he did not even know his name had been used, and when he learnt about it, he understood it was simply a joke. The increased targeting of critical posts on social media platforms has resulted in prosecutions and detentions of online activists. To focus on gaining the hearts and minds of Angolans in the digital realm seems to be Dos Santos’s current goal. 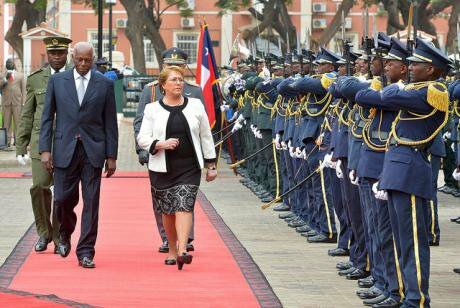 Michelle Bachelet, Chile´s President and José Eduardo dos Santos, Angola´s President, in 2014. Flickr. Some rights reserved. President Dos Santos’s major worry has to do with the international legitimacy of his regime. International pressure by non-governmental organizations, the European Union and several nations have put the Angolan regime under the spotlight. The democratic mask has fallen. Luaty Beirão’s hunger strike and social media competence in spreading his message have turned Angola´s human and civil rights violations into a matter of international concern. This happens at a time when the Angolan economy is under stress. Oil revenues remain the fuel that powers the country´s economic growth, and today, with its price tumbling, the government is expecting a sharp increase in social conflicts and mounting political polarization. Dos Santos is waging a campaign against the critical voices in the country opposing a regime that is short of being a kleptocracy. Social media and digital resistance represent the last frontier in the fight against censorship, a frontier that cannot go undefended if Angola is to remove the shackles of dictatorship anytime soon. As it is the case with a number of other significant oil-rich countries around the globe (i.e. Saudi Arabia or Venezuela), it is time for the international community to reassess what ius more important: economic relations or the defence of democratic values like rule of law, human rights and civil liberties. As Tony Judt once said, “it is time we learn once again to pose the (relevant) political questions”. By doing so in the case of Angola, we should join the courageous digital Angolan activists in their battle for democracy and freedom of expression in the African petro-State. Defending Angola´s digital last frontier is tantamount to ensuring that, on the other side of the battle Dos Santos is yet again waging against Angolans’ liberties, there is someone capable - and willing - to stand by them.